This late in the playoffs, nothing comes easy, and that was certainly true of the New York Giants 20-17 overtime victory over the San Francisco 49ers. Ostensibly the game was won — or lost — because of San Francisco punt returner Kyle Williams’s fumble in overtime, which set up Eli Manning and the Giants for a short, game winning field goal in sudden death. But outside of a few mistakes, the game was incredibly well played. particularly by the defenses. And it was also the type of game where stats can be a bit misleading: 49ers quarterback Alex Smith, as a result of a couple of well placed throws to tight-end Vernon Davis, had the edge over Eli Manning in some key passing statistics, including passer rating and yards per pass attempt, which is my favorite non-advanced passing metric. But those belied the reality: Manning put in an incredible performance against an absolutely ferocious defense, repeatedly delivering key throws under pressure (which he was under constantly). It took him an incredible 58 pass attempts (plus six sacks, making 64 called pass plays) to generate just over 300 yards, but the Giants run-game was nearly non-existent until late. Indeed, if not for the symbiotic relationship Manning had with receiver Victor Cruz — who had 10 key catches for 142 yards — there would have been no 17 hard-fought points, no overtime, no Super Bowl berth. Yet while Cruz was the most important receiver on the field for the Giants, Manning’s best throw of the day went to a guy who had but a single catch on the game: Mario Manningham, whose 17-yard touchdown reception tied the score at 17. 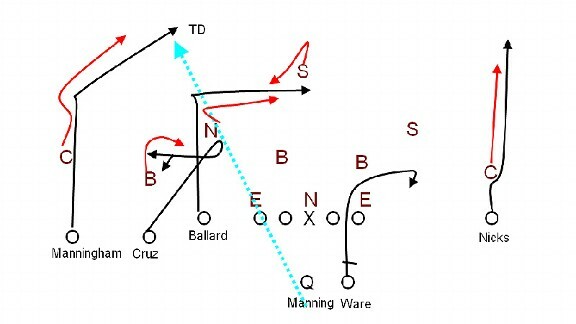 The play — which came, dramatically enough on third-and-15 — was an old, old pass concept known as “anchor” or “Mills.” (“Anchor” refers to the concept more directly, with an underneath receiver hopefully “anchoring” a defender so the post route can get behind him; “Mills” is a name common in many coaching circles, as Steve Spurrier destroyed people with this concept back at Florida in the 1990s and he called it “Mills” after the receiver who ran it the best, Ernie Mills. The Giants’ formation for this was almost as important as the play itself. They commonly like to line up with three receivers to one side and Hakeen Nicks, their best one-on-one receiver, lined up to the opposite side. Indeed, they often give Nicks a “choice route” — harkening back to the Run-and-Shoot roots of the Giants’ offense — and let Manning and he determine what will best get open. And just a few plays earlier on a key third-and-7 on the same drive, the Giants had gone to this concept and Manning threw a quick slant to Nicks for the first down. So, on this third down the 49ers decided not to blitz and rushed only their three down linemen, and used an additional defensive back to double team Nicks. (Note that due to the tight TV angles it’s difficult to see exactly how the 49ers defended this play, but the lack of access to “All-22” game film of NFL games is a topic for another day.) But the more defenders you put to one side affects how many you can put to the other, and Manning and the Giants put an effective concept to the three-receiver side. The inside-most receiver, tight-end Jake Ballard, ran a “square-in” or “dig” route at twelve yards. Had the 49ers not defended him Manning would have rifled it in there, but as it played out he attracted a lot of attention, from the deep safety (just enough) and the underneath coverage defenders. The middle receiver, Victor Cruz, ran a “whip” or “jerk” route, so named because the start-inside-work-back-outside nature of the route makes the guy playing you look like a jerk. But the 49ers played zone and simply covered Cruz up. His role on this play would have been as an outlet had the 49ers defended the deep routes; despite TV announcer handwringing, an eight-yard completion to a guy who can run after the catch on third down is better than a forced throw. But as it worked out he was merely a decoy. On the outside Manningham ran the post. He sprinted to 12 or so yards and broke inside, and he did a nice job breaking his route “flat”. Because the Giants were in the red zone, had Manningham aimed his route more vertically any throw from Manning would have taken him out of the back of the end zone. Instead, however, he broke flat, which was exactly what he needed to do. But to make that work Eli had to make a pinpoint perfect throw — and he did. By taking his route flatter Manningham gave his route a chance, but it also took him closer to the 49ers’ middle safety, Reggie Smith. But Eli delivered a strike, Manningham went up and got the ball and protected it from prying hands, and, in this game, against this defense, it was enough.